The District of Columbia Quarter is the first in a series of coins meant to honor the District of Columbia and the five United States territories, Guam, American Samoa, U.S. Virgin Islands, the Commonwealth of Puerto Rico and the Northern Mariana Islands. 10-square-miles of land, originally part of Maryland and Virginia, was set aside in 1790 to become part of a new "Federal City". This area, dictated by Article One of the Constitution of the United States, was designed to be under the control of the federal government, and not of any state. It became the Nation's capital on December 1, 1800. "My attitude is never to be satisfied, never enough, never." The other quarters available in this series are the Commonwealth of Puerto Rico quarter, the Guam quarter, the American Samoa quarter, the U.S. Virgin Islands quarter and the Northern Mariana Islands quarter. All will be released throughout 2009 in quantities to meet demand. 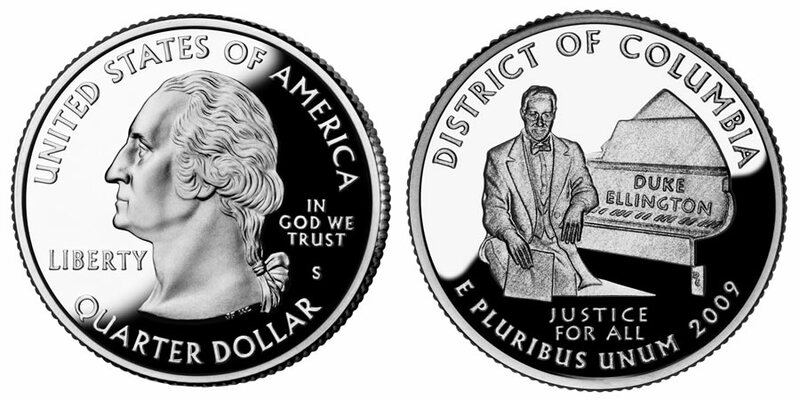 Designed by William Cousins, based on the original design by John Flanagan, a portrait of George Washington is circled with the words "UNITED STATES OF AMERICA" and "QUARTER DOLLAR". Also shown is "LIBERTY", "IN GOD WE TRUST" and the mintmark. Joel Iskowitz designed the reverse and it was sculpted by Don Everhart. It features a seated image of Duke Ellington in front of a grand piano. "DISTRICT OF COLUMBIA, "E PLURIBUS UNUM", "2009" and "JUSTICE FOR ALL", which is the motto of Washington D.C., are also on the reverse.